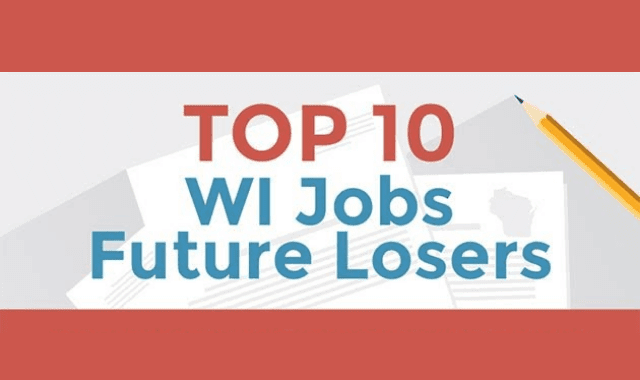 Top 10 WI Jobs Future Losers #Infographic ~ Visualistan '+g+"
The number of jobs in some occupations is declining in Wisconsin, according to these Wisconsin Long-Term Occupational Employment Projections from 2014-2024. The Wisconsin occupation projections in this infographic are for the year 2024 and reflect the projected change from 2014. These projections were derived using May 2015 OES Survey, annual data 2014 QCEW and CES data, unpublished data from the US Bureau of Labor Statistics, CPS and US Census Bureau. These are the 10 occupations that are projected to lose the most jobs by 2024 in Wisconsin. In other words, by 2024, Wisconsin will have 3,021 fewer jobs in bookkeeping, accounting and auditing clerks.